With my whisky interest dating back to 2013, you’ll have to forgive me for not having a big depth of knowledge when it comes to distillery publicity stunts. The Glenlivet Guardians’ Chapter is the biggest one I know, in my limited knowledge of …..ummm… one. But I think it’s a good one, whatever has happened in the past. The ‘guardians’ of Glenlivet (email list of members) spanning 37 different countries, were asked to try samples of 3 different single malts, the “Exotic”, “Classic” and “Revival”. The “Exotic” won but, only just. This became the limited release that we know as the Guardians’ Chapter. The cunning part by Glenlivet is, with so many people involved in the selection process, they can be certain that those who chose the “Exotic” will a) buy it and b) give it a good review. But, even for those who didn’t, there’s a sense of loyalty and duty associated with buying the end product. It only takes one person on a whisky forum to say “I think they’re replacing the Nadurra 16-year-old with a non-aged statement Nadurra” to put me in a panic. Even though someone else added “that’s rubbish!” I was instantly thinking I had to get another Nadurra 16yo before stocks ran out. I’m now wondering if a member of staff at Glenlivet goes around the whisky forums making these comments so idiots like me rush out and spend. If so, it worked! I bought my first bottle of Nadurra back in May 2014, a potent 56.1% from batch number 0813Y. This latest bottle is from batch 0313W and a less feisty 54.8%. Not that I’ll notice the difference because at that strength I’ll always add a bit of water. The Nadurra is one of the few cask strength whiskies available in the UK supermarkets, and as we approach Christmas it’s an ideal gift if you want to give a whisky drinker something different. To keep an eye on the various supermarket deals I’m still using my trusty friend mySupermarket. I always like it when the Whisky Bible says the best part of a whisky I buy is the taste. Yes, the nose is important, and the finish, and the overall balance but, call me old fashioned, I do enjoy the tasting part. Jim Murray’s score of 91/100 contains a taste rating of 23.5/25, which equates to 94/100. He says of this element “fabulous, honey-sweet and slightly sharp edge to the barley: excellent weight and mouthfeel with the honeycomb on the nose making slow but decisive incursions.” His summary says that this 18yo has greatly improved and is well worth seeking out in this form. I only have a miniature of this Glenlivet but I’ve got my sights set on a 100cl bottle only available at certain airports. Currently a normal 70cl version of this 18yo is £58.35 but the 100cl is £65.99, which is much better value. Except, one has to have £65.99, and I’ve currently got desires on other Travel Retail whisky. The Glenlivet 18yo will have to wait its turn. 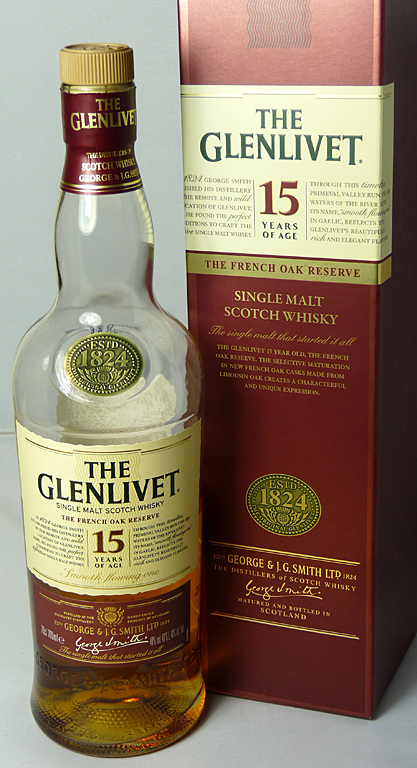 I like the Glenlivet 12yo, I love the Glenlivet 15yo ‘French Oak Reserve’ and I thoroughly enjoy cask strength. 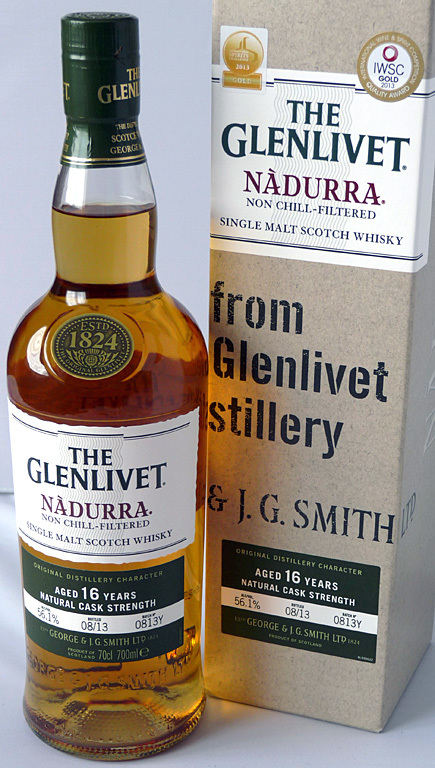 It was only a matter of time before I grabbed myself a bottle of the Glenlivet Nadurra 16yo, which combines the quality I’ve come to expect from Glenlivet with the oomph of cask strength. Being first introduced in 2005, there has been at least one issue of the Nadurra (Gaelic for ‘natural’) every year since. Ralfy’s version in 2011 is 53.6%, the one in the Whisky Bible 2014 is 53%, and the bottle I bought from Waitrose last month is 56.1%. Although the Malt Maniacs haven’t reviewed my version, of the 13 releases they mention, the average is about 83-84/100. Very good indeed! Ask any whisky drinker what dram truly means whisky to them and be prepared for a variety of answers. Which single malt is at the heart of all the comparisons you do? The whisky that provides the blue print that you feel all other whiskies are a variation of? For some it’s the first whisky they ever tasted. For others it’s the whisky they feel has the balance of everything good about the drink but without being challenging in any direction. For some it might even be a blend! For me the Glenlivet 12yo is my benchmark; the malty stick in the ground where other drams radiate from. Although I feel the Glenlivet 12yo represents my idea of the true taste of whisky, that doesn’t mean I think it’s the best. Oh no. It’s definitely an excellent tipple but part of what’s wonderful about whisky is the diversity of flavours that are available. 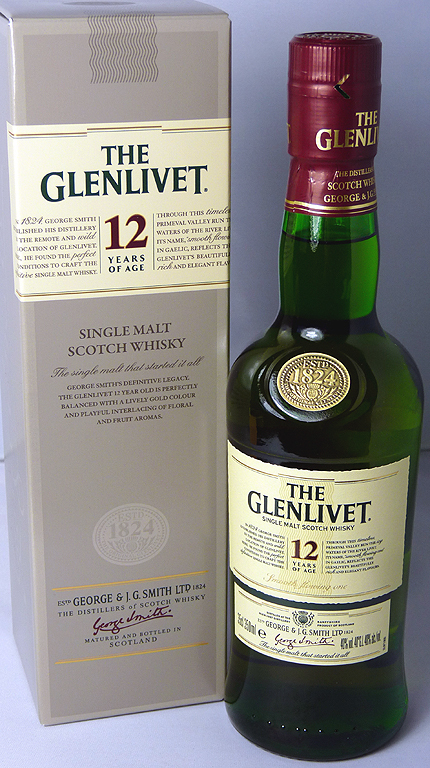 The Glenlivet 12yo can be beaten, and an example of that is the 15yo. As you can see from the picture below, I’ve had quite a few samples and I’m beginning to wish I’d bought a 2nd bottle! It’s similar to the 12yo but with added depth of flavour and a warm hug thrown in at the finish. For those of you with the Whisky Bible you’ll notice the 15yo scores 95/100 but I’ve indicated this as 91/100. There’s an error in the total because the individual scores are 22.5, 23, 22.5 and 23, which makes 91, not 95. Perhaps Jim Murray’s arithmetic goes to pot after a long tasting session. I know mind does! For a video review of the Glenlivet 15yo it’s worth watching Luke Rymarz’s video here which compares the Glenlivet with the Glenfiddich 15yo. Luke mentions how the Glenlivet has a bourbon element and likens it to Makers Mark. Speaking of which, that’s another one on my shopping list! I wasn’t intending to get a new Glenlivet until I’d finished my old bottle (about 20 years old!) but I couldn’t resist this 35cl half bottle reduced from £18 to £12. The ratings for this particular version of Glenlivet aren’t going to set the heart-a-flutter but it’s one of those regular releases you can rely upon as a decent dram. After all these years you’ve got to suspect that the staff at Glenlivet know what they’re doing. The quality is reflected in the price and vice versa. At the time I’m writing this I can also buy a 20cl bottle of Talisker 10yo from a supermarket for £12, the same price as this bigger bottle of Glenlivet. This is definitely a case of ‘you get what you pay for’. My version of that is – a nice dram for not a lot of money. The added bonus is that I’m getting a bottle with the Glenlivet name, which still carries a lot of respect as one of the big boys with history in the wonderful world of whisky.